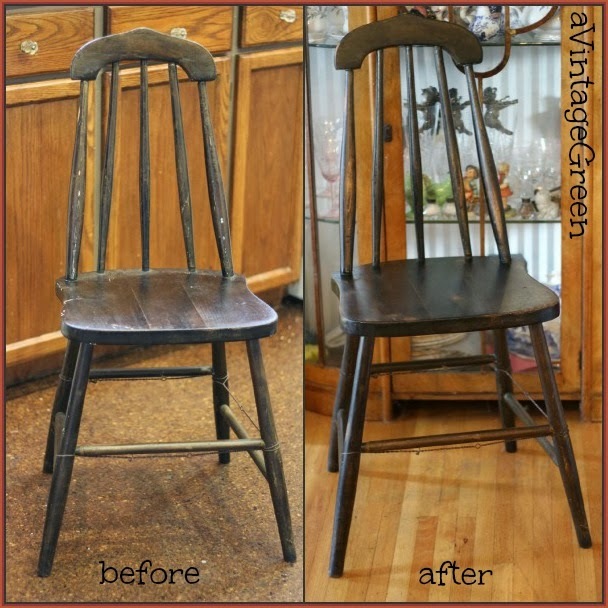 This summer a couple of estate sales provided us several old wooden chairs. Two were in ready to use shape. They needed cleaning and a bit of updating. 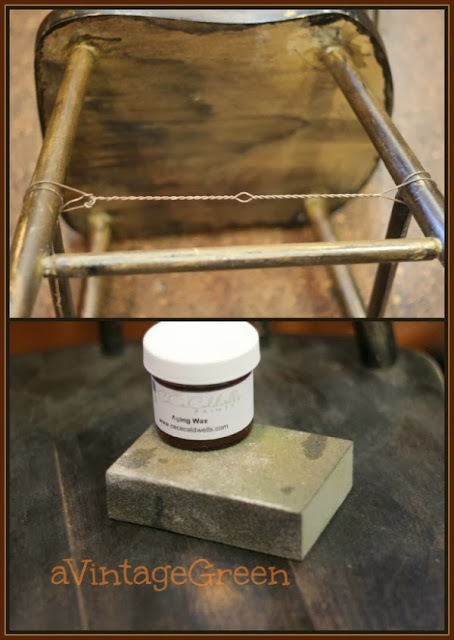 The dark brown chair with twisted wire stretcher supports was lightly sanded only where needed and spots of white paint were chipped up with a thin knife blade. Wiped the chair down, waxed and polished. Any wax would have been fine, I tried out CeCe Caldwells Aging Wax but I suspect it would have been better used on an ornate frame for contrasting shades. 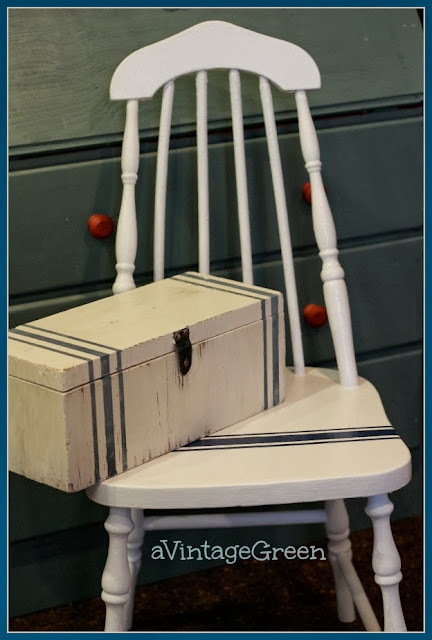 I had such fun painting a small box white and adding faux grain sack stripes a few weeks ago so tried the stripes on the white chair. 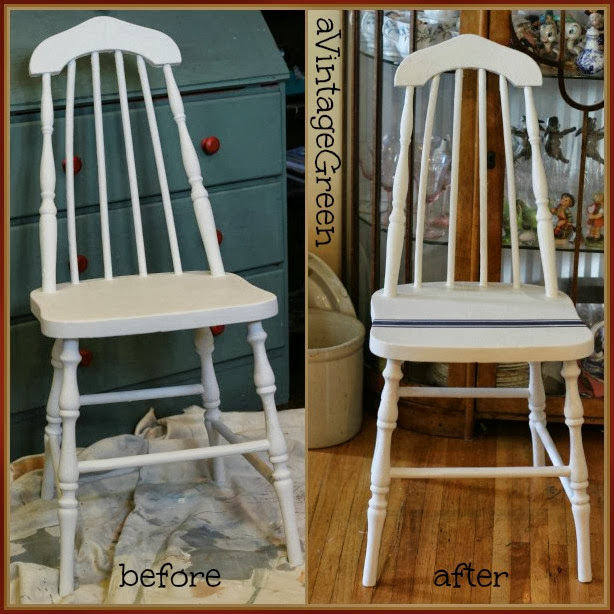 The chair got 2 coats of Simply White to cover the old worn white paint. I used a dark blue paint mixed with CeCe Caldwells Chesapeake Blue for the stripes. Picked up some yellow frog tape to make sure I got good edges. Used the 1/4" Rona green tape as well. Surprise - pulled tape off right away and removed a small chunk of white/navy to reveal turquoise (a colour that was UNDER the white the chair was painted prior to getting painted Simply White. It took a bit of very fine artist brush dabbing and smoothing to repair. The green tape has a much different 'pull off' than the yellow frog tape. Finished the white chair with Minwax Polycrylic. I love the faux grain sack look and have been finding many examples on Pinterest. 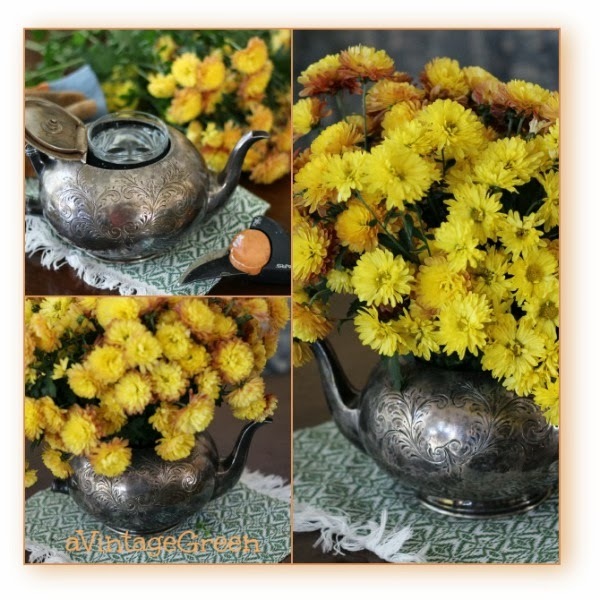 My front porch mums are beginning to fade so I cut several stems to make in indoor bouquet in a handless silver teapot. What I haven't yet figured out is where so many bloggers find/design such tidy icons linked to their follow me sites. Gorgeously clever. I am crazy about the chair and then I scroll down to see the teapot. Not sure which project is my favorite. :) BOTH?? I love the stripes! I was inspired by your box from...was it last week?... and applied the same idea to our master bedroom dresser. Might take it to the kitchen chairs next. Your chairs look awesome! It is amazing what you can do with a little elbow grease. Your chairs turned out very nice. Love your chairs. What a renovation! Mailed you a small gift today - just to thank you for the inspiration you have given John and I. Hope you enjoy! Love the stripes on the box and chair. So different! The teapot is really beautiful, especially with the bright mums. Everything you do is just so pretty!!! 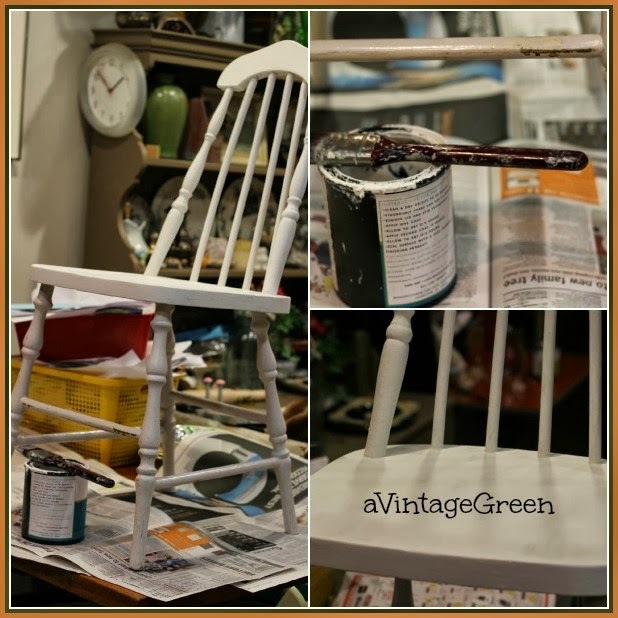 My daughter, Amber, recently did some furniture painting with the chalk paint I have heard you talk about and have seen your projects. Hers turned out nice. My niece gave me a tea pot much like yours. When I get home from this California trip I hope I remember to make a mum bouquet in it like yours! Lovely! Found you via MMS Furniture Feature Friday. I love the faux grain sack look too and recently made an arm chair caddy out of some fabric I painted stripes on in the same way! Such a fun project. The chairs are awesome! Love the change you made with paint! Thanks for sharing at TTF! Those chairs are amazing! They both look wonderful, but my favorite is the one with the stripes! Great job on them! Your chair and box look amazing - so pretty! 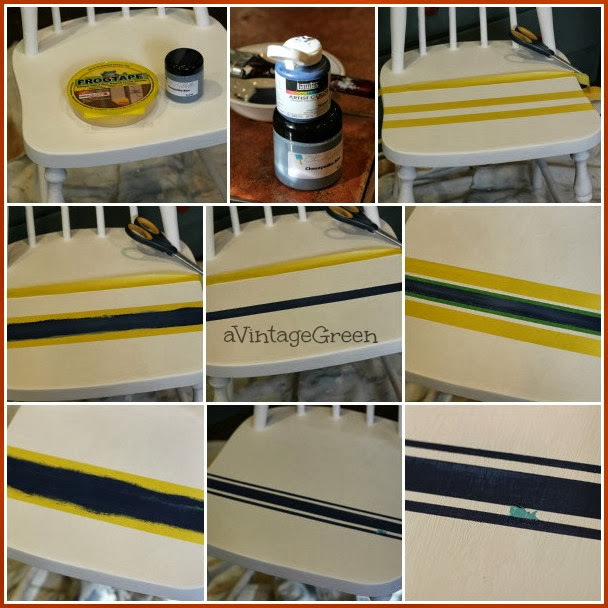 Thanks for providing a tutorial on how to paint faux grain sack stripes. Must try this sometime! Love that grain sack Look. I couldn't tell where you made the repair from the tape. Beautiful job. Your makeovers are nice, the grain sack touch adds that something extra. Well done! I too like the look of the faux grain sack. And what a great idea to arrange the mums in the teapot! I like the improvements you've made to both chairs. The wax certainly made a huge difference on the dark stained one. Also, the mums in the teapot look great. How incredible do those chairs look now. The stripes really make them stand out. 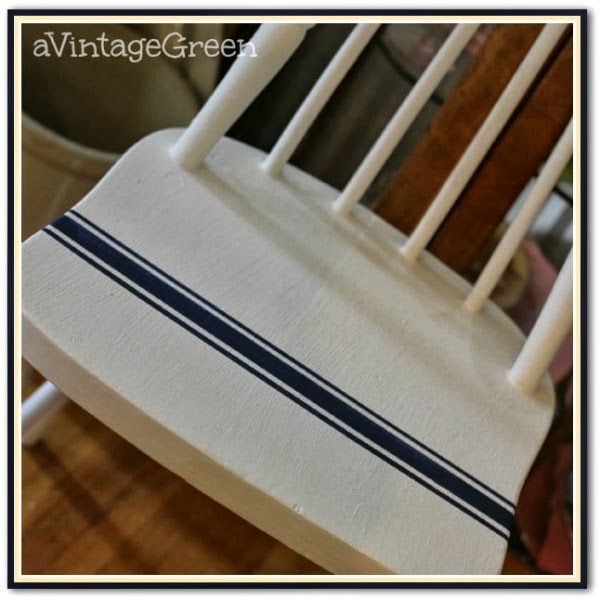 That simple stripe makes that chair look like a million dollars! Great makeovers, you did a beautiful job there. Love the faux grain sack treatment. I may have to try the technique on fabric! Hi Joy...so happy I stopped by...love the chairs and I really love the silver pot!! Great tutorial! Looks great! And I love the teapot used as a vase. What a fabulous job you made of the chair and the box! Amazing what some paint can do. I like your teapot filled with mums too, very cute! So happy you shared this at my HOME and have a beautiful day. What a great finish. Love how it turned out. I have dishtowels waiting to be embroidered that match. I love the blue stripe! It's amazing what a little paint and creativity will do! This chair would look perfect in my son's room--you're inspiring me to start a new project! 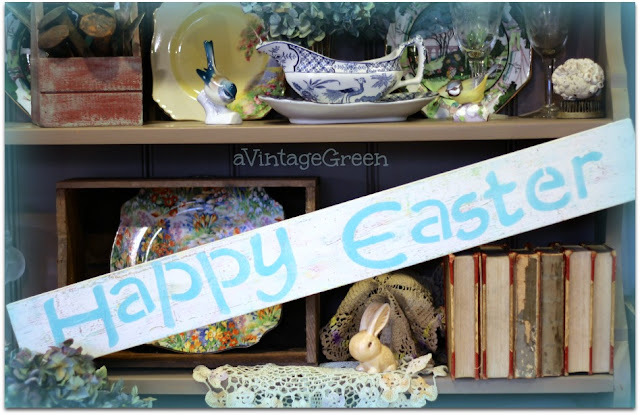 I'm so glad you linked this up to Frugal Crafty Home Blog Hop! Joy, I love it! I so want to paint a grain sack chair with red. Looks so darling with your chest. Thanks for sharing with SYC.